Many highly experienced hunters say that if they could have only one rifle and one scope, it would be something like a .30-06 and a 1-4x scope. 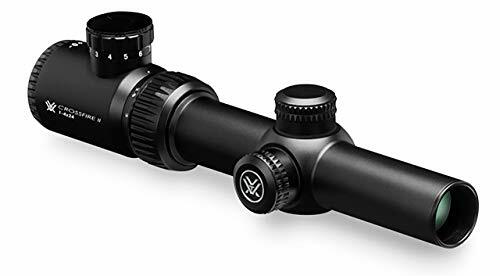 Unless you mainly shoot very small targets or distant ones on the flat open plains, a 1-4x scope is probably the best all-rounder you can get. If you take your time to ensure a good shot placement, as you always should, you can push your 1-4x shot out to about 300 yards. This is true, at least, for mid to large-sized game. At closer ranges, a hundred yards or less, the wide field of view and the both-eyes-open ability of the 1x allows for very quick shot acquisition. This has made this type of scope increasingly popular with military and law enforcement. In urban environments, the 1x benefits have let reflex sights dominate. Now, these products are displacing them thanks to the ability to extend your effective range to most typical, particularly urban, combat distances. Low power scopes can come with a variety of features. When you shop for practically anything, it goes without saying that you want the best possible build quality for the lowest price. Much of the user preference, in general, lies in the reticle. One major option is whether the reticle is on the first focal plane (FFP) or the second focal plane (SFP). An SFP reticle will appear to be the same size no matter what the magnification. FFP reticles can include windage and bullet drop compensation markings that will be accurate no matter the magnification. However, it can be hard to see at low magnification and cover too much of the target at high magnification. Another reticle option is illumination. Illuminated reticles exist to provide high contrast with the target no matter the target's color or the ambient light conditions. Some dislike illuminated reticles because they add weight and cost to the scope. Reticle design is also a major consideration. The range of choices is vast, from simple crosshairs to complex 'Christmas tree' designs with dozens of windage and bullet drop compensation markings. Besides the complex world of reticles, one key consideration is eye relief or the size of the eye box. This is important for letting you quickly get a full sight picture and target acquisition. There are dozens of choices on the market and finding the value for money in a 1-4x scope is a time consuming and bewildering process. Luckily, as usual, we've got you covered with our reviews. With about 15 years in existence, Vortex is giving the grand old players of the optics world a run for their money. This is mainly due to their extremely competitive value for the money ratio and their industry-leading unlimited lifetime warranty. The construction quality checks all the boxes you would expect. The single-piece tube is nitrogen-purged to prevent fogging and sealed with O-rings to waterproof it. The lenses are multi-coated, partly to cut reflection and increase brightness or clarity. Capped turrets return to zero after sighting in. Each click provides half an MOA in windage or elevation with a maximum adjustment of 100 MOA in both. 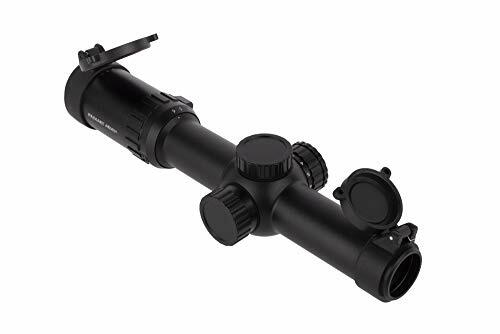 Vortex boasts of the Crossfire II's extra-generous eye box, which is vital for a 1-4x scope. The reticle is Vortex's illuminated SFP V-Brite design. A knob on the eyepiece allows you to adjust the brightness of the dot at the center of the crosshairs. You have the option of ordering this 30mm tube with a two-inch-offset mount. Vortex's outstanding warranty makes buying one of their products worry-free. The top attributes are the wide eye box and the warranty. The illuminated reticle is worth trying to see if it works for you. If not, you can simply turn it off. This product makes shots at 100 yards just as easily as shots at twenty yards. As per the title, the defining feature of this scope is the illuminated bullet drop compensating (BDC) reticle. The illumination gives you the choice of red or green in a range of brightness settings. The battery for the illumination is included. In high contrast situations, you can turn off the illumination to use the reticle in black. The BDC reticle gives you a selection of markings based on bullet drop at various ranges. These markings light up with the aim point and its surrounding semi-circle when illumination is on. The construction specifications are fairly standard, with a single-piece aircraft aluminum tube which has been nitrogen-sealed and set with multi-coated lenses. Each turret click adjusts for half an MOA of windage or elevation. Added extras include mid-height scope rings for a Picatinny rail, a lens cloth, lens covers, honeycomb sunshade, and a felt cover. It comes in two colors, black or dark earth and is covered by a one-year warranty. All things considered, this is a great offering for the price. The illuminated BDC reticle is its top selling point. The added extras are nice too, although you get what you pay for in optical clarity. The warranty could be better, but one year is definitely better than nothing. The choice of colors is a nice touch too. This is another scope designed specifically for the AR platform. Barska has established a name in the 'affordable and good enough' category of the optics world. One hidden benefit is that it bottoms out at true 1x magnification, while many others, especially at this price range, don't go lower than 1.25x or 1.5x. Illuminated reticles are popular on 1-4x scopes as they combine the benefits of a red dot sight with a magnifying scope. This product is no exception. It comes with a mil-dot reticle illuminated in either red or green. With illumination off, it appears black. The brightness control is side-mounted. The mil-dot reticles feature a classic crosshair with four dots spaced along each axis. This allows a trained shooter to judge range and bullet drop. The turrets are exposed for quick adjustment and feature a locking collar to hold them in place. This device has a 30mm tube and comes with a cantilevered mount with a solid six bolts per ring. It also includes a sunshade and lens caps. The lenses are multi-coated and the product is rated as waterproof and shockproof. This is a decent offering for the money. 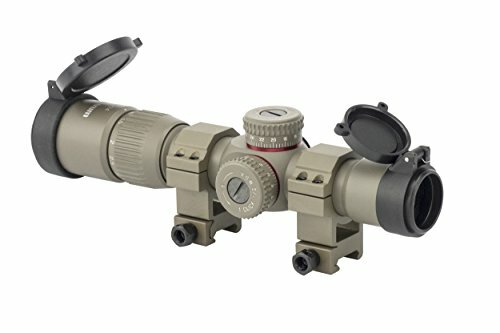 The top selling points are the true 1x magnification and the included cantilevered mount. Great Mil Hash-Marked Reticle is Illuminated for Low-Contrast Situations. 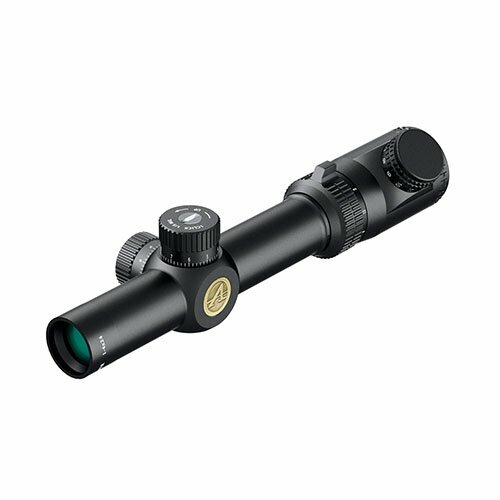 This scope offers many the same benefits of those listed above in a compact package. Athlon gives you their own take on a mil-dot style reticle with hash marks at one mil increments out to eight mils. This is framed in black, ten mil lines on both axes for quick target acquisition. The mil hashes are illuminated in red for low light conditions. The rheostat is mounted on the eyepiece and features a range of brightness options. The exposed turrets allow quick adjustment. Windage and elevation move a fine 0.2 MOA per click and max out at 40 MOA. Build quality ticks all the boxes. It has a heat-treated, nitrogen-purged, single-piece aircraft-grade aluminum tube. The lenses are fully multi-coated for brightness and clarity. Athlon boasts that this product is waterproof, fog proof, and shockproof. The eye relief is very forgiving. Athlon covers this scope with its great unlimited lifetime warranty. Combined with the price point, the warranty makes this a foolproof choice. If you haven't tried an Athlon product, they are very well worth trying out. This unit punches far above its weight. Athlon has thought of everything and addressed every possible issue at less than half the cost of comparable scopes. Plus, they have backed it up with an unbeatable warranty. The excellent reticle is another top feature. This product is highly recommended. For our last scope, why not spice things up with a bit of extra magnification range? This Primary Arms model has 1-6x magnifications, allowing you to reach out and touch someone, or something, with your AR-15, that much easier. This is another product with Primary Arms' illuminated Advanced Combined Sighting System SFP reticle. This unique design provides markings to help you compensate for bullet drop, wind drift, range, and even how much to lead a moving target. The point of aim hovers just over a chevron, so that reticle markings never obscure your target. The illumination is red with eleven brightness settings on a side-mounted knob. It includes a compartment for the included backup battery. Otherwise, the design has the standard build quality features, such as a waterproof, fog proof and shockproof single-piece high-grade aluminum tube. The lenses are fully multi-coated and the low-profile turrets are capped. Additionally, this product is also covered by a lifetime warranty against defects. Scopes like this have helped Primary Arms build an enviable reputation in the AR15 and tactical fields. This is a solid product with all the design features you've come to expect, covered by a decent warranty. The top feature is, of course, its proprietary reticle. A great choice for any AR15. Reflex sights, such as red dots have dominated the tactical market in recent times. The ability to quickly acquire a target with both eyes open through a wide field of view is indispensable, especially at close urban-combat ranges. This logic can transfer over to hunting in anything from thick brush to mixed wooded and open terrain. A 1-4x scope basically offers all the benefits of a red dot sight with the added benefit of 4x magnification. This allows you to take accurate shots out to about 300 yards at medium to large game. A red dot can cover a whole mid-sized animal at 100 yards, while zooming allows you to aim accurately. The weight and cost of a 1-4x scope are often considerably lower than those of a more traditional, higher magnification scope. Most shooting in almost any discipline takes place in under 300 yards. Scopes of 1-4x magnifications allow you to get the best of reflex sights and magnifying scopes at such ranges. It can be bewildering to pick the right 1-4x scope for you, but we're confident you will find a perfect one on our list.